I took part in the ‘thoughtbites‘ workshop looking at ‘folds and layers’ as a method for visual-tactile note taking. I myself have always found it very difficult to keep any notebook in a state that I appreciated it after its use or that I wanted to return to it and remind myself of what I had written. Working with my hands and materials whilst listening I found myself beginning to relax and filter information based on what seemed important at the time. Although I felt I had hardly listened consciously, certain information became very dominant and stuck with me afterwards. Engaging with the materials I noticed that I had used them in various ways that began to make sense to me and that I could see certain methods that I could use in the future and which also could be shared with others as a form of template. Examples were the use of dials and circles (e.g. priorising information, looking at the ‘central’ question), icons that could serve to highlight specific information and covering/uncovering information through material layers as a way of discerning information. In my own research I have come across the functions of the right and left hemisphere of the brain which opens up an interesting perspective on memory retention through visual-tactile means and the workshop has inspired me to include these methods in the future. In mid September, Susan and I met up at the 4th International Visual Methods Conference in Brighton to fly the flag for thinking-through-making-and-doing. While we had originally proposed a panel, we ended up running two workshops titled “Thoughtbites: Transdisciplinary cuts, folds and collage in thought and practice”. As part of that we had been commissioned by the conference organisers to author and print a little booklet that most attendees got in their conference bag (not all of them as the conference ended up over subscribed so we hadn’t printed enough). Titled Thoughtbites – Cuts and Folds in Thought and Practice, this booklet used the work of notable philosophers as starting points for reflection and very basic activities – so people were able (and meant) to customise their own copies, and in the two workshops we used the same starting points to make, reflect on the conference so far and just provide some space for thoughts. The first workshop used the pop-up facilitated by cuts and folds to transform the usually flat surface to a three dimensional structure, complete with little windows to glimpse through. We were inspired here by Rene Descartes’ notion of the material world and its non material counterpart, the subjective and objective, abstract and material, mind and body. 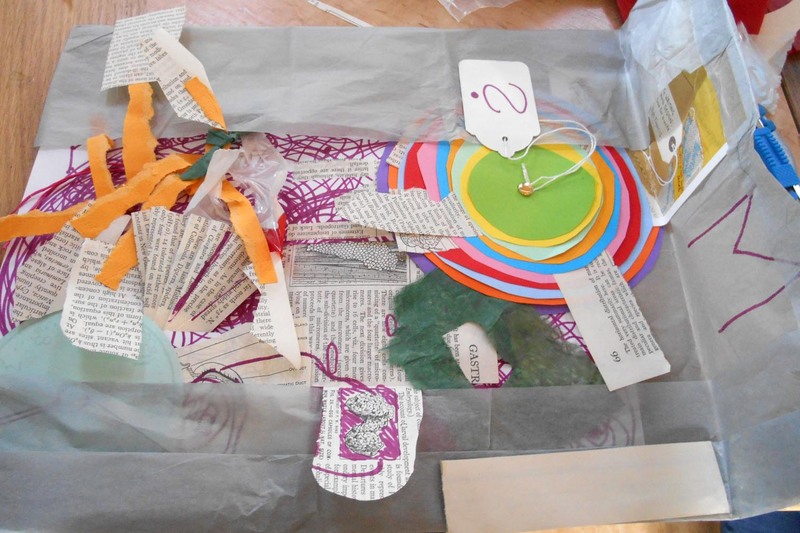 We also explored layers, inspired by Edmund Husserl, thinking about layers of meaning and how they reveal and conceal, sparking new trains of thought. The second workshop explored the idea of tracing – and Gilles Deleuze’s suggestion that we should focus on the differences of tracings, the intentional and unintentional losses and gains, in order to reveal meaning. We also looked at Jacques Derrida and the fold as well as the moebius strip – is it possible to determine one side from the other? Does it matter? Looking back what was most interesting was the way discussion unfolded. While some people came to both sessions, mainly people attended just one. But what was really different was the set up. The first session was done in the ‘Waste House’, a workshop space constructed pretty much entirely from recycled materials. Here we had one huge table, which resulted in everybody sharing materials with each other and a very informal conversation that included everybody throughout the 90 minutes. The second session was in a more traditional seminar room, where we had set up a number of smaller group tables. And while people were talking at their tables, the atmosphere was markedly different (though not necessarily in a bad way). Overall it was a nice few days, with maybe some people encouraged to make some more time and space to reflecting through enjoying the process of making.